For more than 25 years, Serrapeptase has been used by millions of people concerned about their health. Originally, Serrapeptase was exclusively used in Asia and Europe due to its anti-inflammatory activity, but when the benefits of this miracle enzyme spread many other countries began to use it for its wide range of benefits. For many the question still remains, what exactly is Serrapeptase and what are the benefits for which it has gained such enormous popularity? Serrapeptase is an enzyme naturally produced by friendly serratia bacteria living in the intestines of silkworms. Living organisms produce enzymes to help speed up specific chemical processes. In the case of Serrapeptase, it helps speed up the breakdown of proteins, making it a proteolytic enzyme. 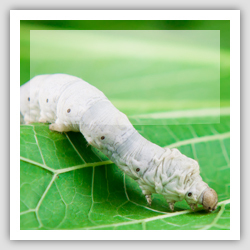 Although the role of Serrapeptase in nature is to literally eat through silkworm cocoons, researchers have found that it performs several additional functions that are beneficial to the human body. When taken orally on an empty stomach, Serrapeptase is absorbed by the small intestine and enters the bloodstream. As a result, Serrapeptase has the ability to rapidly decrease the signs and symptoms of inflammation while speeding up tissue repair. It also digests proteins that form scar tissue, blood clots, cysts, mucus and arterial plaques, among others . Since living tissue is not broken down by Serrapeptase, taking this enzyme poses no threat to healthy tissue or cells. The ability of Serrapeptase to reduce excess fluid that may accumulate at the site of a wound (edema) also affords this enzyme with anti-edemic activity. It is not surprising that the use of enzymes with anti-inflammatory, proteolytic, fibrinolytic, and anti-edemic activity such as Serrapeptase, have become increasingly popular dietary supplements for individuals suffering from inflammation as well as swelling of the mucosal membranes (e.g., ear, nose, throat). Serrapeptase also has the ability to inhibit the release of pain-inducing amines such as Bradykinin from inflamed tissue. Bradykinin is a protein that causes blood vessels to dilate and its main function is to increase the sensation of pain. Bradykinin also makes nerves in inflamed tissue more sensitive, causing them to be hypersensitive to heat and light touch and creates a general sensation of soreness. By leading to the reduction of proteins that cause pain sensations and soreness, Serrapeptase shows promise as a pain-reducing supplement. Due to these benefits, Serrapeptase also offers a safer alternative to long-term use of non-steroidal anti-inflammatory (NSAIDs) drugs. Serrapeptase reduces the accumulation of fibrin in the body which subsequently decreases the risk of developing blood clots and arterial plaque. Fibrin is a protein that is typically produced by the body in response to an injury and is responsible for the formation of blood clots and scar tissue. When produced in the right amounts, fibrin prevents excessive bleeding from a wound and is an important part of the healing process. However, when too much is produced, blood clots may persist and increase in number, resulting in deadly health problems such as heart attacks, strokes, and deep vein thrombosis (DVT). Complications that are caused by fibrin can also lead to a number of chronic and progressive diseases such as Alzheimer's, endometriosis, and fibrocystic breast disease (FBD). Fortunately, research has shown that taking enzymes that dissolve fibrin, which is the case for Serrapeptase, helps remove excess fibrin from the body and prevents this protein from being overproduced. Therefore, Serrapeptase has the potential health benefits of preventing dangerous blood clots from forming, reducing scarring, and improving cardiovascular health by preventing arterial plaque buildup. Serrapeptase is also capable of reducing neutrophils in the bloodstream, which are white blood cells that have been associated with respiratory inflammation. Neutrophils generally accumulate at a site of infection to ingest and destroy harmful cells. However, they tend to accumulate in lungs of individuals who have respiratory diseases and cause inflammation. Serrapeptase may have beneficial effects on respiratory health by reducing the number of neutrophils that can accumulate in the respiratory system.